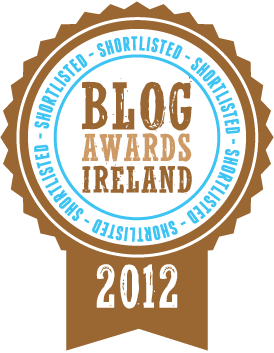 The Silver Voice – Shortlisted for Blog Awards Ireland 2012! I was thrilled and honoured to have been nominated for the Grafton Media Blog Awards Ireland 2012 some time ago. Having read some of the incredibly excellent work of others in the long list, it was clear that the opposition was formidable and the standard very high… It came as a huge surprise then to learn that this blog has been shortlisted in the Best Lifestyle Blog category! The business of blogging is alive and well in Ireland; hundreds of bloggers are putting their all into their posts. The categories have attracted entries from a broad range of people – from primary school children right up to professional journalists; from craft workers to fashionistas, from cooks to gardeners, from music buffs to photographers, and everything in between! Well done to the organizers for taking on the task of sifting through the many entries and to Grafton Media for being the main sponsor. Such efforts encourage and promote the use of the internet by people from all walks of life and from every profession and I am all for that! Every single nominee is a winner! The very best of good luck to all on the shortlist! The Famine Diaspora. What became of them? Many who went to the United States of America fought on both sides of the American Civil War. Many suffered terrible wounds. Many died. In the USA Civil War veterans are remembered with pride and all things Civil War have enormous tourist potential. Isn’t it time that we Irish acknowledge the contribution our starving ancestors made to the formation of America? Isn’t it time that we Irish acknowledge the tourism potential in having memorials to this part of our very proud history? For an academic ‘take’ on it, read Damian’s recent blog post above. A bit of Craic in Croagh, County Limerick! Every working day I travel the N21 passing by the village of Croagh, County Limerick. 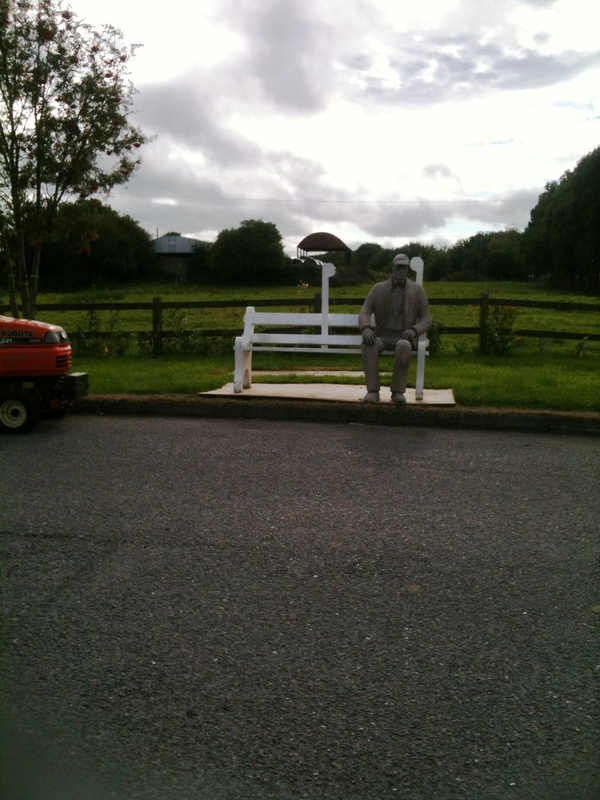 In recent months I have been intrigued by a very handsome solitary capped figure sitting on a bench on a side road just off the main road. Very realistic, it took a few days for me to realize that Croagh Man is not real! 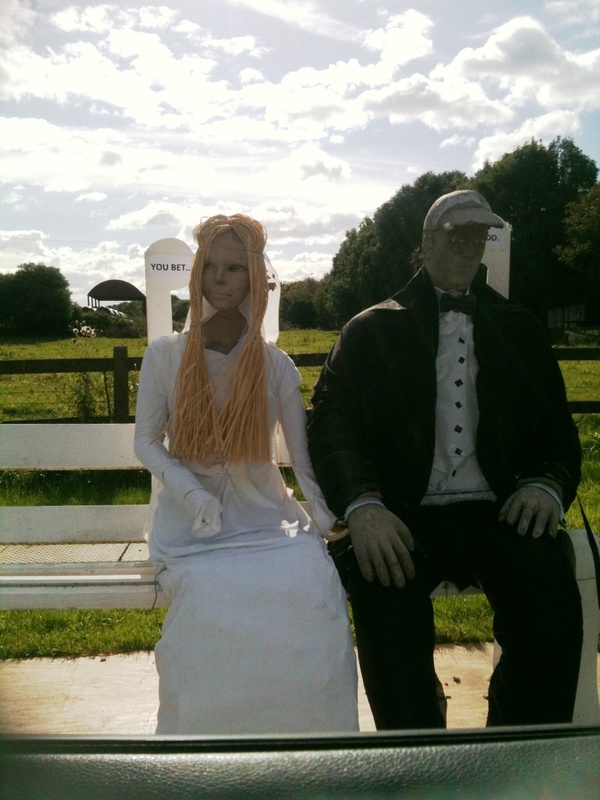 Imagine my astonishment last week to find that he was kitted out in black tie, dress shirt and had a bride by his side! No ordinary woman this – this is a genuine authentic dumb blonde with straw hair! Today I was equally astonished to find that Bride of Croagh Man had vanished! For non-Irish – a bit of ‘craic’ – pronounced ‘crack’ = a bit of fun – totally drug-free! A history of Ireland in 100 objects.